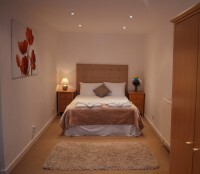 Large double room and sitting room combined for the perfect relaxing stay. Ensuite shower facilities and with it's own access makes this ground floor room a popular one for extended stays. A lovely base to explore the surrounding Angus countryside and glens.